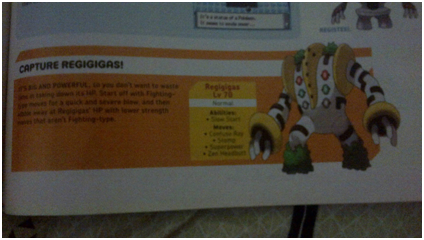 What moves does the Regigigas in Diamond know? My own picture of the guidebook if you don't believe me. regigigas CAN'T learn stomp from my source. Level 70. I have the guidebook for Diamond and Pearl postgame. He learns Stomp as a starting move in Diamond & Pearl. LOL. I have it too, and mew is correct. How do you get Regigigas in diamond? In Pokemon Diamond, how do you get the Regigigas Pokemon in the Snow temple? Should I let my Regigigas learn Crush Grip? Does this work for Regigigas?